The Trail Adoption Plan began in 2011 to maintain and improve our trail network through community engagement. Now contributing over 5 000 hours of labour per year, TAP has become an essential initiative to continue to keep our trails world class. Working with the respective Land Manager, work is brought to appropriate standards aimed at sustainable solutions using modern techniques. With respect for the environment, the work aims to lessen impact, divert water and minimize erosion. Each Adopter is led by a trained NSMBA Builder to lead the efforts. The NSMBA wishes to thank all of the Adopters listed below for their contribution to make the Shore a better place. The NSMBA also wishes to thank all of the Builders for their leadership. Finally, the NSMBA would like to thank all of the volunteers for their hard work. Without you TAP would not be possible. 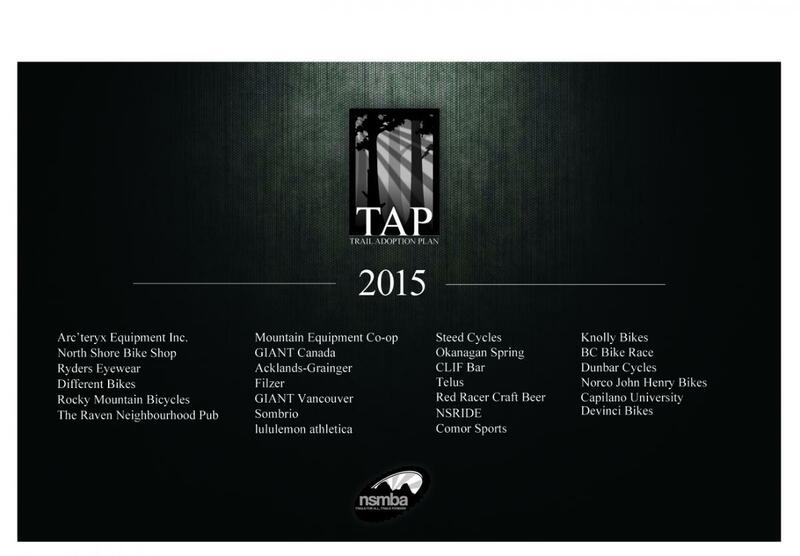 TAP 2015 is now accepting applications for adoptions. To be part of the awesomeness, please email TAP@nsmba.ca.